It's the week of retired priests at CatholicTV! Today retired priest Fr O'Regan came all the way from Centerville to celebrate Mass with us. Father O'Regan remembered Monsignor Frank MacFarland in his Mass and for that we are so greatful! Here he is with his sister who joined him for Mass, pictured with Msgr Frank's rosary. Yesterday we were joined by Fr Cunney who lives over at Regina Cleri, the Archdiocesan residence for retired priests. He was a joy to have and gave a wonderful homily about the significance of fragrant oils, which is perfect for today, the day of the Boston Chrism Mass! You will see Fr Cunney again on tomorrow's Mass, when Father Reed concelebrates with several priests from Regina Cleri for Spy Wednesday. Watch on CatholicTV and CatholicTV.com LIVE at 9:30am ET, and again at 7pm and 11:30pm. On Holy Thursday we will premiere a special new Triduum rosary, shot entirely at Regina Cleri, and that will air throughout the Triduum. Please keep the retired priests of Boston in your prayers! In the Archdiocese of Boston, the Easter collection will be for the sick and retired priests of Boston, and I urge you to consider giving what you can to support these men who have given their lives to serve all of us in the Church. It's so wonderful to be able to see the seminarians from St John's Seminary in Brighton at the station here at CatholicTV. Whether it's to attend Father Reed's class on communication and evangelization in the conference room, or to accompany a priest for Daily Mass, they are welcome visitors! Today Father Ed Riley celebrated Mass for us, and was joined by Deacon Chris Wallace who will, by the grace of God, be ordained this May. Deacon Chris is a member of Our Lady of Good Counsel parish in Quincy. Before Mass, Father Reed asked Fr Riley to bless our new vestments for Solemnities, and Deacon Chris joined Fr Riley in being the first to wear them! Thanks Deacon Chris and Fr Riley! There is not much I can add to the wonderful night that just took place at St. Peter's. It was truly an extraordinary experience that was so presented so well by the CatholicTV Network. The entire staff did an excellent job in bringing these events into your home. It was truly a team effort. Please pray for Pope Francis I. May God guide him and protect him as he leads this Church we all love. Hello to all my blogolites. Rome is crying tears from heaven as the rain comes down hard. Tim and I went to St. Peter's Square early in the morning and I am glad we did. As we entered the square I saw a lone figure in the distance. As I approached, I saw a man dressed in a burlap sack kneeling on the hard stone ground praying. I suddenly noticed that he had no shoes on and that his feet were battered and worn. It was clear that he had walked a lot of miles without shoes. I watched him for quite a while. People would walk by him or take pictures of him but he did not look at them. My first thought was that he was a beggar because there are a lot of those in Rome. But he was not asking for money. I saw a nun give him some coins and I wondered if I should do the same. A number of thoughts crossed my mind: should I give him some money? who was he? was this a scam? I decided to give him coins but hesitated. I was nervous to approach this man who was dirty and very different from me. Then I thought of the readings from the Mass with the Cardinals yesterday and specifically "love one another". I made my move. I approached him, held out the coins and he opened his hand. The coins clang as they fell into his hand. I thought that was the end of my meeting with him and began to turn and walk away. But he thanked me and asked where I was from. He told me he was from Assisi. He pulled a pamphlet out of his bag and told me to love the poor. He again thanked me and said May God bless you. I walked away. I must have broken the ice because after I left a group gathered around him and I could hear them asking questions. He answered in a very gentle way. If you open up your heart and mind, if you don't let the fear of the unknown limit you, the world expands. Love your neighbor and God will love you. I am standing in St. Peter's Square as I type this and am stunned by what I am witnessing. Let me set the scene; it is pouring out and it is cold. I am not hesitant to call it raw out. My guess is it is below 50 degrees. Around the square the Vatican has set up huge monitors and are broadcasting live coverage of the Cardinals inside the Conclave. The square is a sea of umbrellas. Thousands of people are surrounding the monitors to be part of history. The bad weather and cold can not deter these people. This is their faith and they are here to show solidarity with the Cardinals that are charged with making this difficult decision. Inside the colonnades are thousands of people who await the puffs of smoke that will signify whether or not a Holy Father has been elected. I was touched as I passed a group of seminarians praying the rosary together as they looked up at the smoke stack. You may notice some young people on the side and in the back who just walked up and started praying with them. As I write this more people are joining and their voices are getting louder on the square. Just beautiful. We are living in historic times. May god guide all of us as we pray for the Cardinals. Hello to my fellow blogolites. I must make an admission right from the start. This blog is going to be long and have a lot of pictures. 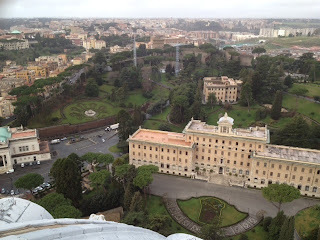 There is no other way I could do this blog today because it was a truly spectacular and moving morning in Rome. The day began with an 5:30am wake up call so that Tim and I could head over to the Pontifical North American College. It was an opportunity to get some pictures of the American Cardinals as they boarded a bus for the Mass at St. Peter's. The walk over is short but we always have to climb a number of stairs to get to the NAC. We waited along with the other press in the rain for the bus to arrive to take the Cardinals. It was the usual chit-chat and small talk and everyone was in a good mood. We started to notice seminarians gathering along the road. The bus arrived and the Cardinals exited the building and made their way to the bus. Some waved to the press while others just smiled. The bus made its way down the road with the seminarians lining either side. It seemed as though the whole college was there. The men clapped and cheered as the bus slowly went by them. The bus turned a corner and then was gone. From the NAC we made a quick dash down the hill and hurried to St. Peter's Basilica. We had heard we should get there early for the 10am Mass and that was our goal. Upon arrival we were deflated to see a long line and it was only 7:30am! We got in line and within minutes the line doubled and then tripled in length. As I got inside I was pleased to find that I was going to be relatively close up. I sat and was struck by a couple of things. First at the number of very young nuns who were in the Basilica. They were everywhere and all were smiling and happy. They were also looking out for each other and saving seats. It was refreshing to see so many young woman decide to dedicate themselves to Christ. There was a bounce in their step and a vibrancy about them. It just made me feel good. When I looked up at the altar I noticed two things immediately. The first was the cross over the altar and the second was the empty chair. That chair would be used later but it made me reflect on the fact that at this moment we do not have a pope and there is an emptiness. They prayed the rosary in many different languages but all with the same intent. To pray for the Holy Spirit to guide the Cardinals in their deliberations to elect a new Holy Father. It was very moving hearing the whole congregation joining together as one powerful prayer community. As we finished praying the rosary a hush fell upon the people in attendance. The music started and the Cardinals began to process down the main aisle. But something was different. For the week before the Cardinals had been out and about. Before they agreed not to talk to the press they spoke with reports, laughed, and spoke with the faithful. Now everything had changed. There was a seriousness, a focus that is tough to describe. They seemed in the zone. As they processed, my mood changed also. I felt nervous and even frightened for the them and the weight of the decision that they were going to have to make. It was during the second reading that their responsibility resonated even more for me. In his letter to the Ephesians St. Paul wrote, "We must no longer be children, tossed to and fro and blown about by every wind of doctrine, by people’s trickery, by their craftiness in deceitful scheming" (Eph 4:14). The Cardinals must make a decision not based on public polls or today's social norms, but on the truth presented by Christ. In the Gospel of St. John the message was clear. "You did not choose me but I chose you." A chilling line that shows God's great love for us. During communion the congregation knelt on the stone floor and prayed. In a special way I remembered all of you who have asked CatholicTV for prayers. 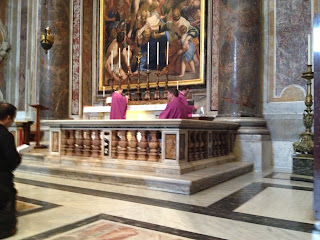 I watched as one by one the Cardinals went to the altar and received The Eucharist. I could only image what they were thinking. It seemed though that they were at peace. Knowing that Jesus was with them at this historic moment. But the weight of the decision that is before them is enormous and will be studied and talked about for centuries to come. From the beauty of the liturgy it seems they do not take this task lightly. As they processed out of the Basilica the congregation all came to the barriers to get a closer look. A person in the crowd began to clap but a Cardinal gently motioned for him to stop. This was not about them. This was about the Church founded by Jesus. Please pray for these Cardinals as they begin the Conclave and may God guide their decision. Hello blogolites! Want to come to Rome? Monsignor John Abruzzese has some tips for you! Thanks for stopping by this morning, and I hope you have the chance to one day come to Rome! This is just a quick post to thank all of you who have left comments or have contacted me. I am enjoying the conversations. It can feel quite isolating when you are away from home even in the beautiful city of Rome. I would like to tell all of you who have asked for prayers while I am in Rome that I will certainly do that when I am in St. Peter's at Blessed Pope John Paul II's tomb. In a special way I will remember a young man Mike who is engaged and PJ and of course Kevin's father-in-law. I will also remember all those who have written in and asked that their named or someone they know be put in the prayer box. I know that Father Reed remembers those people everyday and I will do the same while I am in Rome. If you would like a person remembered while I am here please leave their name in the comments. I ask that you also remember my family, the CatholicTV Staff and me in your prayers. Hello to all you blogolites. We had a surprise guest today here in Rome: the sun! It has been very cloudy and raining a great deal the past week so this was a welcome change. I hope it lasts. 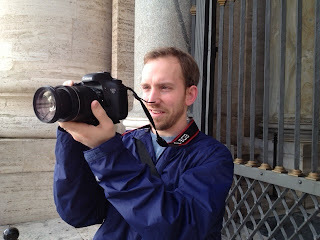 Tim and I went to St. Peter's Square this morning to shoot some interviews and some promos. On the way we bumped into Terry Donilon, the Secretary for Communications for the Archdiocese of Boston. We have only seen Terry a couple of times because of his busy schedule and our schedule put us in different locations in the city. Back to the square. 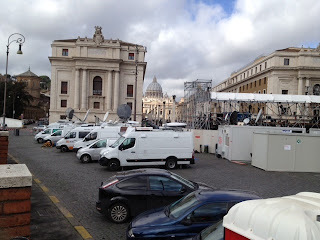 They are setting up for the election of a pope. The Vatican has a lift truck that they used to install the curtains in the middles balcony where the new Holy Father will walk out from. The number of press here is growing by the minute. Some try to sneak into the square but they are quickly confronted and ushered out. The press mostly line the gate that surrounds the square. They actually are in the street and cars need to dodge them. As I wrote in a previous post these are the best drivers in the world. No horns, just quick turns and cuts in traffic. 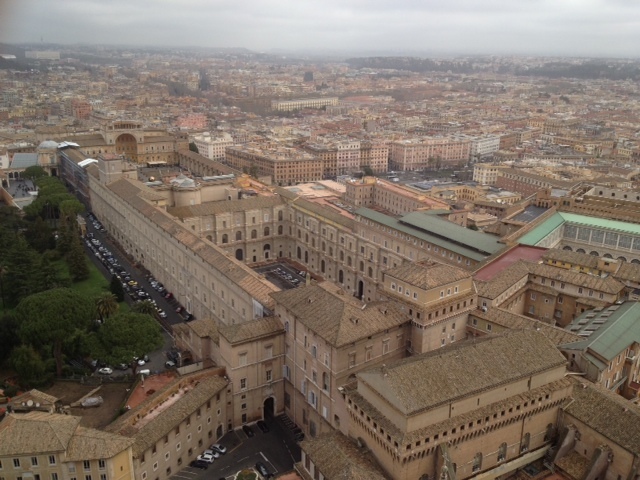 It is an amazing day in Rome as the world prepares for the Conclave. Stay with the CatholicTV Network and in particular Father Reed, Msgr. Maroney, Kevin Nelson, and me for exclusive coverage. You can watch on CatholicTV.com, your iPhone/iPad or Android, Roku or GoogleTV. Hello to all my blogolites! Today I woke up to blue skies and warm temperatures in Rome. Throughout the city, the Cardinals celebrated Masses at their titular churches. Scot Landry covered Cardinal Sean O'Malley's Mass very well on his blog. There are also some beautiful pictures from the very talented George Martel. Now back to those blue skies; they didn't last. It is now pouring out and the Tiber river is expanding and flowing rapidly. A couple of quick observations about Rome. After watching the scooters and small cars whip around each other and weave in and out, dodging people and other vehicles I was convinced that these were the worst drivers in the world. After watching them more closely I am now sure that they are in fact the best drivers in the world. They never hit each other or pedestrians. It is like a live demonstration of the game frogger were the frog tries to get across the road. These drivers are truly remarkable! They move at rapid speed, all over the place, with scooters darting in front of them and nothing happens. They do not beep their horns or slam on the breaks. Truly remarkable. It's thundering and I have a small tv in my room to help ride out the storm. It has over 900 channels to choose from, which is the good news. Every one of those 900 channels are in Italian. The bad news: I do not speak Italian. Stay well and please pray for all the Cardinals voting in the Conclave. This afternoon I would like to discuss the media presence in Rome. One word to describe it is massive. I have been to Rome many times to cover events because we are a television network and our role is to bring programming into homes that inspire people to live out their faith more fully. I was fortunate to be in Rome from the death of Blessed Pope John Paul the II through the election of Pope Benedict the XVI. I do not think that anything will top those few weeks in regards to media, but this is close. 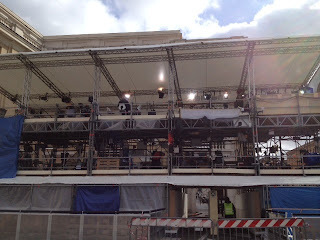 There are over 5000 accredited media in Rome to cover this event. Most are regarding this as news and will move on to their next target soon after the installation. CatholicTV regards this as a historical moment that will affect the lives of all those who watch CatholicTV. We bring a perspective that other stations would ignore. We invite our viewers to pray with us and await with great anticipation and hope the election of the next Holy Father. While most stations have huge crews and gigantic budgets, CatholicTV has just Tim and I to cover this life changing moment. There is a line of satellite trucks costing hundreds of thousands of dollars to send their stories around the world. We use Skype and the Internet to send ours for free. Yet with only the 2 of us, and our cheap way of doing things, our message is stronger than all the others. We are transmitting more than a sound byte, more than a story. We are demonstrating that the Catholic Church is alive and vibrant. The Church is relevant and the fabric of so many people around the world. It is with this charge that Tim and I continue to search out the stories that will affect people's lives in a positive way. Our role is simple; bring people closer to Christ through the use of television and media. I pray we are doing that and I thank all of you for your kind comments and affirmation and support. Let us join together and witness history together. Hello to my fellow blogolites! Before I tell you about the special blog I will bring to you this morning, apologies are in order. I have been writing this blog for a week and have not recognized the fine work of Helen Lee. For this I am sorry. I send my musings back to the States and somehow Helen makes them coherent and uploads them onto the page. She is the engine that makes this vehicle run. 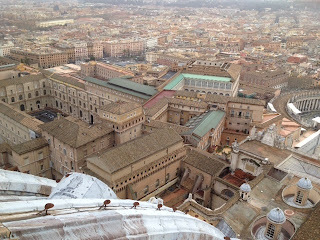 Today we are going to take a photo tour of my walk up tithe dome of St. Peter, or as it is called in Italian, the cupola. In all my travels to Rome I have never gone to the cupola so this will be an adventure for all of us. Tim and I arrived early to climb the stairs, we thought there would be a long line but it was just us and a couple of young ladies. 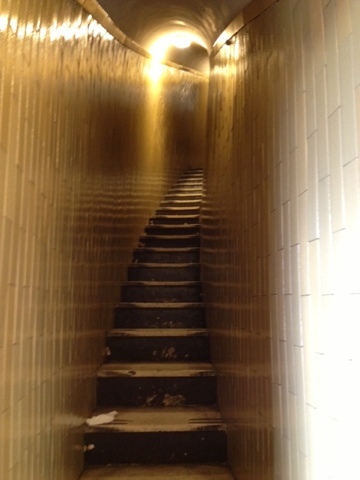 We had our choice of taking the stairs or the elevator. Being brave we chose the stairs. I found out that brave and foolish are sometimes closely related. What a climb. 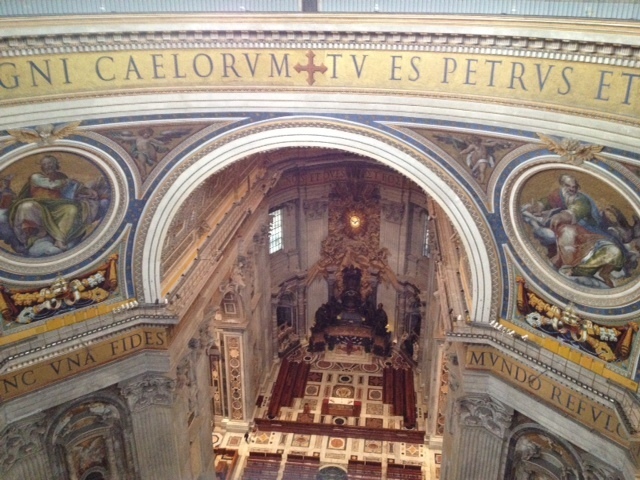 Our first stop was inside the cupola looking down into St. Peter's. Here you can see the view. I actually got a bit confused and it took me a few minutes to figure out how to get outside. My confusion may of been from exhaustion because of my "brave" decision to take the stairs. Let's discuss the stairs. 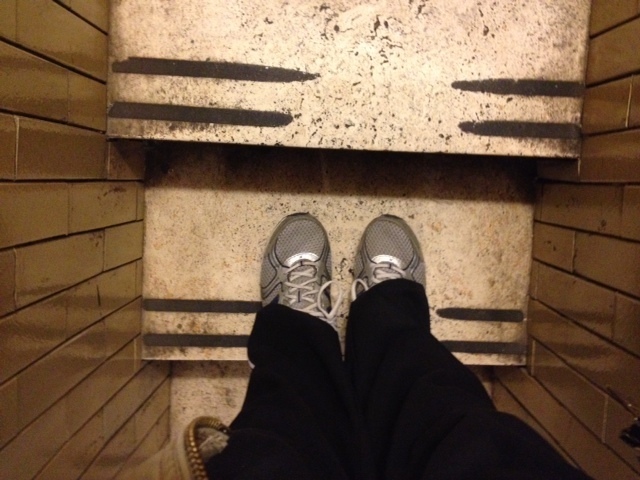 Here are a picture of my feet on the stairs. As you can see they are very small and this next picture looking up shows how steep they are to climb and how the walls lean way to the right. As I climbed my shoulder and head hit the wall to the left. In full disclosure, I found this interesting and fun. I finally made it out onto the outside of the cupola and WOW! It is breathtaking. Literally it takes your breath away. Before me was the city of Rome in all its beauty. Here you will see pictures of the square. I could have stayed in the cupola all day but alas I had work to do in other parts of the city. 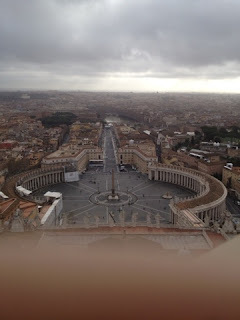 As I made my way down, the first exit led me to an area right behind the statues of Jesus and the apostles that reside on top of St Peter's basilica. Here's a picture from a position you rarely see. From there I made my way down into St Peter's and then out to the square where I typed this blog. The Cardinal says: "Stay with us..."
Hello to all you blogolites! A date has been set for the Conclave. It will start this Tuesday afternoon. 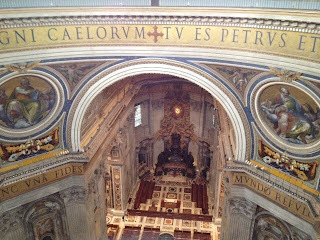 In the morning the Cardinals will celebrate a Mass at St. Peter's Basilica. It has been with much prayer and anticipation that the faithful have awaited this decision. The Cardinals from around the globe have been meeting with each other to discuss issues and concerns that need to be examined in the Church. It seems as though there has been much discernment and reflection before they decided on a date. A time and date was not the issue, but coming to a consensus of what needed to be addressed and taking the time to understand first what the questions that should be asked must be, and then the answers to those questions had to be developed and scrutinized. The Vatican is a tiny country surrounded by Italy. But this small country has the attention of the world. That focus will be intensified starting on Tuesday and grow with each moment that a pope is not named. There is an excitement and a sense of wonder as we await the decision of the Cardinals on who will be the next leader of the Catholic Church. Let us continue to pray that the Holy Spirit guides these men in their deliberations. I hope all is well with you wherever you are reading this blog. For the third day in a row it was a rainy morning in the beautiful city of Rome. In a sense that was very appropriate because today we interviewed the pilgrims from Boston who were following the steps of Blessed John Paul II. It was in 1979 that he visited Boston, Massachusetts and celebrated a Mass in an absolute downpour. During the the Mass, to great applause, he said, "America the beautiful, even in the rain." So it was in this gloomy rainy backdrop today that the pilgrims would complete their journey from his birth and baptism in Poland, to his resting place inside St. Peter's Basilica. Father Chris O'Connor, who is leading this pilgrimage, celebrated Mass at the tomb of blessed JPII with the pilgrims as his congregation and with Father Jonathan Gaspar and Father Eric Bennett con-celebrating. During his homily Father Chris said something that resonated with me. He used a line that Blessed John Paul II often quoted, "be not afraid." During this time of Papal transition we are like a flock of sheep without our Shepard. We are almost adrift as we eagerly await the election of a new Holy Father. But we should not be afraid because God walks beside us to guide and comfort us in good times and bad. He only waits for us to invite Him into our hearts and minds. He is the anchor that keeps our boat buffeted from the waves of doubt and rocks of despair. How fortunate and loved we are as He calls all of us by name. The world is waiting for our new Shepard but God is ever present and permeates the air we breathe and move in. As St. John said, " God is Love." Thank you for reading my blog and know you are never alone! Hello to all my blogolite (my new term) friends! We just heard that a date was not set for Conclave in the morning session as they await the arrival of one final Cardinal. Today they discussed finance, which is required during the transition of a papacy. I have to admit, when I heard the news that a date was not set I was disappointed. OK, I was more than disappointed. I was passing angry and going right to ticked on the emotion scale. Don't get me wrong, I love Rome. In fact, it's my favorite city and I have a number of friends here. It's that I miss my family and I'm going to miss my children's play, sports playoffs, and most importantly their smiles. Don't the Cardinals know I have things to do?! But I thought about it and realized something important. They do care that I have things to do, and they care that you have things to do, and they want to make sure they make the right decision so that this faith that is so important to all of us is protected. They cannot rush to judgment. They need to take their time, pray, and make a decision that will be of benefit to the Church and the world. What an awesome responsibility it is to be charged with being the Vicar of Christ. The Holy Spirit is part of these deliberation as are all of us through our thoughts and prayers. We need to trust in the process. We need to pray for these decision makers. We, and I especially mean me, need to realize that we are not picking out our furniture or a car; we are choosing the Apostolic Successor to Peter. In a world that demands quick answers and instant updates, I say let's all slow down and become part of this historic moment, opening our hearts and minds to the reality that God does not have a stop watch. Thank you my fellow blogolites and know I am thinking of you while in Rome. Hello to all my blog friends following our adventures in Rome! Today Tim and I traveled to St Peter's square for an early morning interview. You'll be able to watch a video soon so stay tuned. I love St. Peter's square. It is a blend of so many different people from around the world. By the time I left the square, the line to get into the Basilica stretched all the way around the colonnade to the other side. I felt like telling the pilgrims they had a LONG wait to get through to the metal detectors and security. There are statues of the saints lining the colonnade. 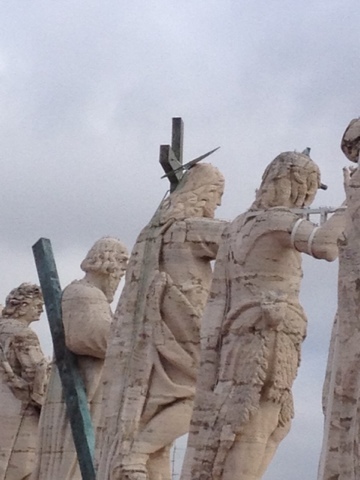 In the past few years the structures and statues have been cleaned due to the generosity of the Knights of Columbus. They look brand new. The Basilica had gotten so dirty over the centuries that it looked black instead of white and hid the beauty. In fact, when they cleaned the area where the newly elected pope will walk out it revealed beautiful marble red columns and green marble above the door and on the side. 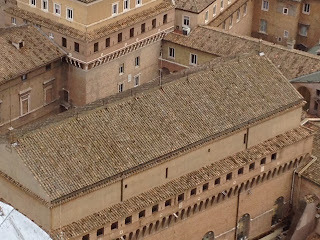 At first people were outraged because they thought that the Vatican had painted those areas. What they did not know was that those were the original colors, and that they had been hidden by the grime over the centuries. Look to see if you notice it during coverage by CatholicTV! That is all from Roma (that is my Italian). Hello to all my blog friends! Well it has been a busy day in Rome. Father Chris O'Connor from the Archdiocese of Boston is leading a pilgrimage through Poland and Rome. I had the chance to briefly catch up with them in St. Peter's square and they are a wonderful group. Aldona, the Director of the Master of Arts and Ministry program is on the pilgrimage as well as students from MAM and the TINE program. It is clear that they are having a blast. After meeting with the pilgrims from Boston, Tim and I were off to the NAC. We found out that the Cardinals had decided to halt all press conferences so the 2:30 taping was out. That however did not slow us down. Thanks to Msgr. Burrill we were able to interview 4 seminarians and a priest who were from different dioceses across the country. What a group of outstanding young men. I couldn't help but think that these are the future leaders of the Church. If that is the case we are in good hands! Watch for a special with these men soon on the CatholicTV Network. From the NAC, Tim and I went to St.Peter's for the prayer service. I told a person from ABC News that Father Reed was supplying commentary for CatholicTV. I met Terry Donilon and Greg Tracy, and also Angela Flood from the Archdiocese of Washington there by happenstance. It was a beautiful service and I was struck when I saw 2 nuns kneeling on the stone floor. There was a great crowd all participating in the service. Another wonderful day in the very rainy city of Rome. That is right-- it's pouring, and without an umbrella I am now a soaking mess. Time to dry off. Last time I wrote you may remember that I was rushing to get to St. Peter's to do a live Skype interview with Father Reed and Kevin. It had been a very hectic day and time was not a luxury that I had. I would like to set the scene at St. Peter's. It is swarming with pilgrims and tourists. The surprising fact is that most of the people visiting are relatively young. It's refreshing to witness so many people filled with their Catholic faith. Surrounding the square are the press. Not just a few press people, but hundreds. There have been over 5,000 press credentials given out for this event. The press hover on the outskirts of the square, never crossing the invisible line to get inside. They bounce around from one end to the other. If one does cross into the square they quickly are greeted by the ever present security. The greeting is not pleasant but always brief. It consists of a request for credentials, and if the press person does not have them, they are politely but firmly asked to leave. It's amazing how many security guards there are on the square. Some drive in small cars, some are in uniform and on foot, and some are undercover. It was in this environment that I did my live feed inside the square. I did it with my iPhone. 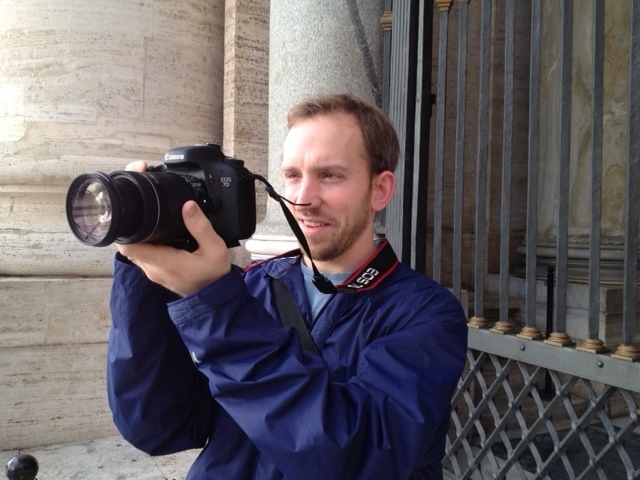 I held the phone out, arms length away, with St. Peter's behind me. As I did this security was swarming my area watching me closely. My arms grew tired from holding the camera and I was fearful that I would be asked to leave during the interview. If you watch the "This the Day" interview, you will see that I am looking around constantly. During the interview people could hear Fr. Reed and Kevin on my phone and could see me talking so some started to gather. It was stressful, but fun! That's all for now. More to come later so stay tuned and I hope you keep reading. As an aside, as I've been writing this, an elderly Italian man keeps singing as he cleans the area I am in during these early am hours. He is very happy this early in the morning and I have to admit that it put a smile on my face.